A Robert Gordon University (RGU) student was honoured to play a role in the Paralympic Heritage Flame Ceremony earlier this month. Gray’s School of Art student, Cal Docherty, was selected to be part of the design team for the ceremony that took place at Stoke Mandeville Stadium in Aylesbury, Buckinghamshire, on Friday 2 September. The event featured the lighting of the Paralympic Heritage Flame – the only torch lighting outside of the host country, Brazil. This flame travelled to Brazil, to be combined with others from across Brazil and arrive in the Olympic stadium for the start of the Rio 2016 Paralympics. 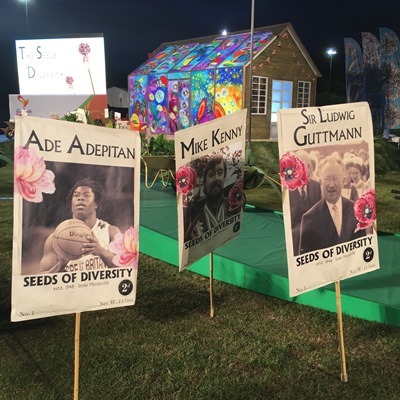 Cal said: “The ceremony’s performance was called ‘The Seeds of Diversity’ and it demonstrated the values at the roots of the Paralympic movement, started by Sir Ludwig Guttman in the 1940s. The Paralympic Heritage Flame Ceremony is held in Stoke Mandeville, made famous as the place where Sir Ludwig Guttman created the first sporting competitions for disabled people in 1948. This year’s ceremony was directed by Bradley Hemmings, who was the director of the London 2012 Paralympic Games Opening Ceremony, and was broadcast live on Channel 4.